The first of the three planned Pankow Conversations took place on October 9th, 2017. 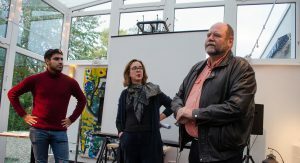 This civic engagement project is a collaboration between BCB students, faculty, staff and alumni, various activists across Berlin (such as the Berlin Storytelling Arena), and the Pankow Bezirksamt. Every event is translated into German, English and Arabic. In this podcast, we sit down with alumni coordinator Melina Vanni-Gonzalez and current BA student Clara Canales Gutierrez to hear their impressions of the project so far, which strives to connect members of the Pankow community. The next event, CommuniTEA, will take place on November 15th in the factory.